Richly textured Pineapple motif is adapted to a floor rug. 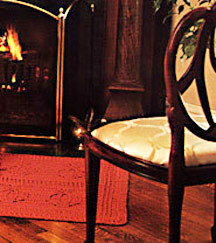 Adds warmth in front of the fireplace or makes a practical addition for kitchen and bath. Approximate finished size: 44 by 32. Size J crochet hook, or size to obtain given gauge. Note: Use double strand throughout. Raised Double Crochet: When worked on a right side row: Yarn over (yo), insert hook in space before stitch (st) from front to back, bring hook across back of st and out in the space after st, going from back to front and around the post of the stitch, draw up a loop, (yo and draw through 2 loops) twice. When worked on a wrong side row: Yo, insert hook in space before st from back to front; bring hook across front of the st and out in next space after the st, going from front around post of the st and to back; draw up a loop, (yo and draw through 2 lops) twice. With double strand, chain (ch) 113. Foundation Row: Double crochet (dc) in 4th chain (ch) from hook, dc in each ch across--111 dc. Ch 3, turn. Note: Ch 3 on turn is always counted as first dc of the next row. Row 1: * Raised double crochet, dc; repeat from * across. Ch 3, turn. Rows 2, 3, 4: (Raised Double Crochet, dc) 3 times, dc across to last 6 stitches (sts); (Raised Double Crochet, dc) 3 times. Ch 3, turn. Row 5: (Raised Double Crochet, dc) 3 times, dc over next 12 sts, * Raised Double Crochet over next 4 sts, dc over next 19 sts; repeat from * across, end dc on 13 sts, (Raised Double Crochet, dc) 3 times. Ch 3, turn. Row 6: (Raised Double Crochet, dc) 3 times, dc over next 10 sts, * skip 2 dc, Raised Double Crochet on Raised Double Crochet, dc back in the 2 skipped sts, Raised Double Crochet on 2 Raised Double Crochet, skip next Raised Double Crochet, dc on 2 dc, Raised Double Crochet on skipped Raised Double Crochet, dc on 15 sts; repeat from *, end dc on 11 sts, (Raised Double Crochet, dc) 3 times. Ch 3, turn. Row 7: (Raised Double Crochet, dc) 3 times, dc on 8 sts, * (skip 2 dc, Raised Double Crochet on Raised Double Crochet, dc on 2 skipped dc) 2 times, (skip Raised Double Crochet, dc on 2 dc, Raised Double Crochet on skipped Raised Double Crochet) 2 times; dc on 11 sts; repeat from *, end dc on 9 sts; (Raised Double Crochet, dc) 3 times. Ch 3, turn. Row 8: (Raised Double Crochet, dc) 3 times, dc on 6 sts, * skip 2 sts, Raised Double Crochet on Raised Double Crochet, dc back in the 2 skipped sts, dc on 2 sts, Raised Double Crochet on Raised Double Crochet, dc on 4 sts, Raised Double Crochet on Raised Double Crochet, dc on 2 sts, skip Raised Double Crochet, dc on 2 sts, Raised Double Crochet on skipped Raised Double Crochet, dc on 7 sts; repeat from *, end dc on 7 sts, (Raised Double Crochet, dc) 3 times. Ch 3, turn. Row 9: (Raised Double Crochet, dc) 3 times, dc on 6 sts, * (Raised Double Crochet on Raised Double Crochet, dc on 4 sts) 3 times, Raised Double Crochet on Raised Double Crochet, dc on 7 sts; repeat from *, end dc on 7 sts, (Raised Double Crochet, dc) 3 times. Ch 3, turn. Rows 10, 11, 12: As Row 9. Row 13: (Raised Double Crochet, dc) 3 times, dc on 6 sts, * skip Raised Double Crochet, dc on 2 sts, Raised Double Crochet on skipped Raised Double Crochet, dc on 2 sts, Raised Double Crochet on Raised Double Crochet, dc on 4 sts, Raised Double Crochet on Raised Double Crochet, dc on 2 sts, skip 2 sts, Raised Double Crochet on Raised Double Crochet, dc on 2 skipped sts, dc on 7 sts; repeat from *, end (Raised Double Crochet, dc) 3 times. Ch 3, turn. Row 14: (Raised Double Crochet, dc) 3 times, dc on 8 sts, * (skip Raised Double Crochet, dc on 2 sts, Raised Double Crochet on skipped Raised Double Crochet) 2 times, (skip 2 sts, Raised Double Crochet on Raised Double Crochet, dc on 2 skipped sts) 2 times, dc on 11 sts; repeat from *, end dc on 9 sts, (Raised Double Crochet, dc) 3 times. Ch 3, turn. Row 15: (Raised Double Crochet, dc) 3 times, dc on 10 sts, * skip Raised Double Crochet, dc on 2 sts, Raised Double Crochet on skipped Raised Double Crochet, skip Raised Double Crochet, Raised Double Crochet on next Raised Double Crochet, Raised Double Crochet on skipped Raised Double Crochet, skip 2 sts, Raised Double Crochet on Raised Double Crochet, dc on 2 skipped sts, dc on 15 sts; repeat from *, end dc on 11 dc, (Raised Double Crochet, dc) 3 times. Ch 3, turn. Row 16: (Raised Double Crochet, dc) 3 times, dc on 12 sts, * (skip Raised Double Crochet, Raised Double Crochet on next Raised Double Crochet, Raised Double Crochet on skipped Raised Double Crochet) 2 times, dc on 19 sts; repeat from *, end dc on 13 sts, (Raised Double Crochet, dc) 3 times. Ch 3, turn. Row 17: (Raised Double Crochet, dc) 3 times, dc on 10 sts, * skip 2 dc, Raised Double Crochet on Raised Double Crochet, dc on the 2 skipped sts, Raised Double Crochet on 2 Raised Double Crochet, skip next Raised Double Crochet, dc on 2 sts, Raised Double Crochet on skipped Raised Double Crochet, dc on 15 sts; repeat from *, end dc on 11 dc, (Raised Double Crochet, dc) 3 times. Ch 3, turn. Row 18: (Raised Double Crochet, dc) 3 times, dc on 11 sts, * skip 2 sts, Raised Double Crochet on Raised Double Crochet, dc on 2 skipped sts, skip Raised Double Crochet, dc on 2 sts, Raised Double Crochet on skipped Raised Double Crochet, dc on 17 sts; repeat from *, end dc on 12 sts, (Raised Double Crochet, dc) 3 times. Ch 3, turn. Rows 19, 20: As Row 2. Rows 21, 22, 23, 24: As Row 1. Repeat Rows 2 through 21 once more. Do not fasten off. Round 1: Ch 3, work 1 dc in same corner stitch, work in dc to next corner (work an odd amount of sts), * in corner work 2 dc, ch 1, 2 dc; work in dc to next corner, repeat from * around entire edge, ending with 2 dc, ch 1, slip st to starting ch. Round 2: Work as for Round 1. Round 3: Ch 3, dc in corner, * dc in next st, (Raised Double Crochet, dc) to next corner; work corner; repeat from *, end 2 dc in corner, ch 1, slip stitch to starting ch. Fasten off.